Mysteries, common everywhere, 98: kiln-cast glass, glass taxidermy eyes, glass bell jar, patinated cast bronze, found object, ultra-bright LED, paint, MDF. © Paul W. Leathers, 2003.
as 'standing out', standing out above the rest of the field in which we form a part. Rico Franses, Ph.D., In the Picture, but out of Place: The Lacanian Gaze, Again. This project continues an ongoing exploration of material, light and vision. Recently, I have been exploring the use of light to attract and re(locate) the viewer, to provide an unexpected sense of discovery and to address notions of conceptual and intellectual illumination. I am interested in how such elements may be brought into conjunction in order to create novel experiences for the viewer to encounter. 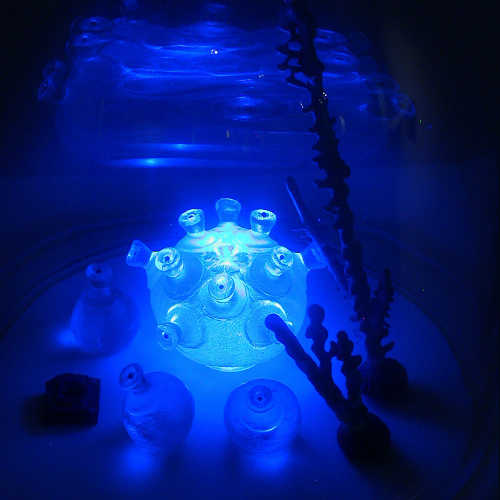 In past artworks, I have used LineLight UV reactive plastics, Cyalume Lightsticks, reflective 3M Scotchlite, water-filled glass lenses, etc. to both attract and hold the viewer's gaze in order to collapse their perception and experience of spatial distance. Rather than the disconnected experience of an observer, the viewer activates a (direct)ed physical relationship with the artworks. Approaching this project from within the context of a studio practice based primarily on the creation of small-scale objects, I concur with Barnett Newman's statement that within the landscape of the imagination "
size is nothing, what matters is the scale." Rather than facilitating a confrontation with heroic grandeur  as much of contemporary sculpture already does  I am interested in developing in the viewer an awareness of their perceiving body as they circulate throughout the gallery space. Paul Carter states, in his recent book entitled Material Thinking, that often when artists are "... called upon to talk about what they do, they rationalise its internal logic instead of gauging its social effect. Rather than account for the work as a structure for reinventing human relations, they explain the ideas behind the work. As a result, they dematerialise the process that produced it, creating a two-dimensional text...." My intent for the on-line component of my current project is to resist such textualizing effects. I wish to have the visitor engage with the creative process in a way that an artist's statement, or even the display of the artworks themselves, cannot fulfil. I wish to provide visitors with the added opportunity to make a social connection: to engage with and discover the process for themselves. In mathematics and physics, Chaos Theory deals with the behaviour of certain non-linear dynamical systems that are characterised by sensitivity to initial conditions and exhibit chaos. 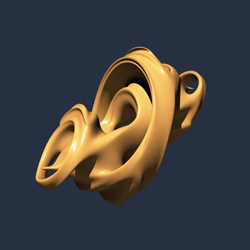 David Ruelle and Floris Takens coined the term Strange Attractor in their paper, "On the Nature of Turbulence" [Communications in Mathematical Physics, vol. 20, pp. 167-192, 1971], in which they describe the complex geometric structure of an attractor during a study of models for turbulence in fluid flow. 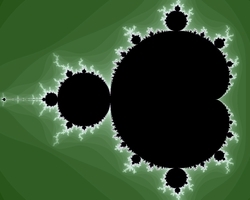 Perhaps two of the most familiar visual representations of such chaotic phenomena are the Mandelbrot Set (l.) and the Lorenz Attractor (r.) pictured below. "... [A]rt is the stuff thats left over. 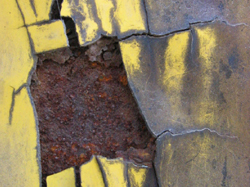 Its the thing that occurs when intentionalities collide, like flint and steel, when the intent of the artist meets the (often hidden) intent of the material with which she is to work. Art is not the material object that artists produce, it is not the concept or the space or the words we create as artists. It is the stuff that remains; the stuff we are left with after we have said or made or thought or written what we have to say or make or think or write. It isto borrow a phrase from Slavoj Zizekthe indivisible remainder of the interaction between our intentions and our materials." Timothy Don, Negotiations: 1: What Puts the 'Aargh' in Art? (2005). Creativity, as is Chaos Theory, may be seen as a form of non-linear system whose evolution is deterministic  in the sense that its future is determined by its current state and its past history. 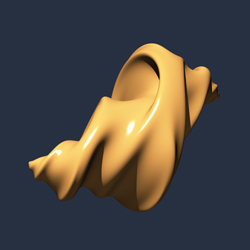 Floris Takens' Delay Embedding Theorem states that a dynamical system can be reconstructed from a sequence of observations of the state of the dynamical system. This introduces, for me, the notion that the viewer of an artwork on exhibit in a gallery may be able to deduce  as well as the artist's conceptual intent  something of the process of its creation. Memories of growing up in an art-oriented household include activities that focused on developing co-ordination and hand skills. Tinkertoy elements and LEGO blocks could be assembled into something new each day and provided hours of entertainment. 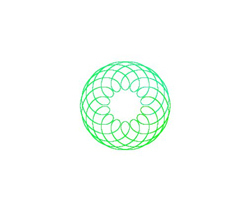 While a little more constrained, Spirograph created patterns that, today, often remind me of engine-turning or guilloché. I recently discovered a simplified version at a local dollar store and thought that it might be a design tool worth revisiting. A little frustrated with the initial results, and no longer a child of the nineteen-sixties but a computer savvy twenty-first century adult, I went online to find a more in-depth virtual version. I also have an interest in exploring non-Euclidian forms through such visual representations as the three-dimensional cross sections of a quaternion Julia set illustrated below. I think that my attraction to these forms stem from their similarity to skin-like membranes stretched taught over a visceral internal structure. I find that software programs such as Gaston v0.94 allow me to visualise a number of formal possibilities and then to select from among the more interesting ones for real world development through more traditional means. As with the adventurers of the High Middle Ages, I find such virtual possibilities a terra incognita (L., "unknown land")an undiscovered country ripe for the exploring. In her catalogue essay for the exhibition Skin: Surface, Substance and Design, Ellen Lupton offers the opinion that a "... new organicism has taken shape most aggressively across the surface of things. The primacy of the skeleton [the exposed Modernist structural space frame] has given way to the primacy of skin. Surfaces have acquired depth, becoming dense, complex substances equipped with their own identities and behaviors." Elsewhere Lupton states that "Contemporary objects and spaces are cloaked in surfaces that have been enhanced, simulated, or engineered, surfaces that masquerade as other materials, surfaces where the physical and the virtual, the real and the imagined, collide. 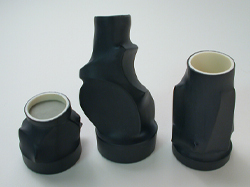 Hard surfaces look soft, and soft surfaces look hard." 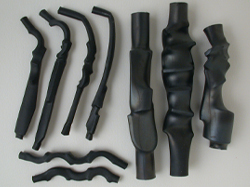 I have long been intrigued by the spontaneously structured surfaces generated by the stretching of heat shrink tubing or latex party balloons over various interior materials. Such forms provide a sense of tension between that which is hidden and that which is revealed. Using new coating materials such as two-tone chameleon paint, I intend that the objects that will result from this investigation will, by changing colour, be responsive to the viewer's location. Material transmutation is a thread that is common to the arts of fire (Gaston Bachelard's term): glass, metal and ceramics. I have observed that ceramic artists often define their work, or themselves, by the materials and processes which they employ: wood-fired versus cone 6 oxidation, thrown versus hand built, etc. The inventory often culminates with the hushed reverence afforded to porcelain, and more recently, to Southern Ice porcelain. As author Janet Gleeson reveals in The Arcanum, it was the nineteen-year-old alchemist Johann Frederick Böttger who, while attempting to create synthetic gemstones in the early years of the 18th Century, fired the starter's pistol on the European search for a method of making porcelain. While not a true porcelain in the strictest sense (kaolin and feldspar fired to cone 10), his results were a convincing  if somewhat temperamental to work with  imitation. What excites me about the ceramic body that I have been using in these artworks (calcium sulphate and silica frit fired to cone 06) is that it is castable and, after undergoing its transformation by fire, produces a convincing result. 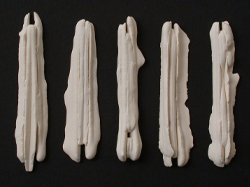 Recently, I have been exploring forms that have been created by trailing liquid clay slip onto plaster sheets and assembling the results. The process of working with this plastic material allows me to explore a number of possibilities quickly, reserving those that I am interested in and recycling the rest. Gaston Bachelard states, in Water and Dreams, "... it is in this last combination that the double reverie of form and matter suggests the most powerful themes for creative imagination." "For it is with the mixture of water and earth," he continues, "that we are best able to understand the principles of a psychology of material cause." 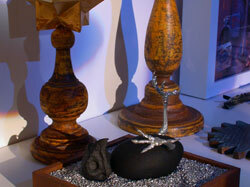 The selected forms retain a characteristic sense of 'flow' and the liquid nature of water combined with earth. I also appreciate August Strindberg's admonishment: "The art of the future (which will disappear, like everything else! ): Imitate nature in an approximate way; imitate in particular natures way of creating!" 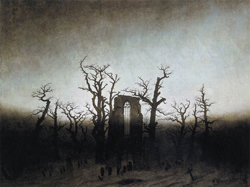 My first exposure to the artworks of the German Romantic painter Kaspar David Friedrich came during an Art History lecture one evening at art school. I think that I audibly gasped as an image of monks walking through a snow covered landscape filled the entire end wall of the lecture hall. I sensed a potency in the apparent relationship between the monks, the trees and the ruined chapel. In a way, the scene was later played out when my wife Trudy and I were married in the ruins of the Trappist monastery in St. Norbert, Manitoba before heading off to the opening of Rub(icon), our exhibition/wedding reception. Under the sub-heading From Fragment to Chaos, Michel Makarius, in his recent book entitled Ruins, explores the theoretical approach to 'the fragment' promoted by the German Romantics. He offers Friedrich Von Schlegel's famous definition: "Similar to a work of art in miniature, a fragment must completely detach itself from the environing world and, like a hedgehog, close in on itself." The fragment is introspective. "On one hand," Makarius states, "a fragment's brevity unburdens it from the leaden hand of analytical argument; on the other, its affirmative nature, the ideas it can convey, keep it distinct from purely poetic utterance." Vladimir Nabokov, Transparent Things (1972). While exploring the visual language of material and form, the artworks in this body of work also engage with Post-Industrialism's interest in the processes and outcomes of the handmade artifact. 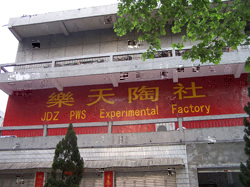 Travel to mainland China in the fall of 2005 provided an opportunity to visit the PWS Experimental Factory in Jingdezhen, the historical home of 'blue and white' porcelain. 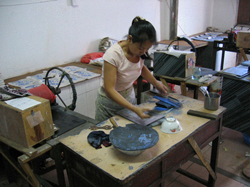 While in Jingdezhen, I witnessed various manufacturing processes and was captivated by the printing onto tissue paper from etched metal plates of cobalt blue ceramic over glaze transfers. I thought that the results might be useful in my own studio practice for transferring imagery onto various substrates. Many of the antiques dealers in Jingdezhen had cabinets or shelves in their stalls crammed with bowls full of shattered porcelain. 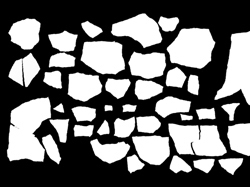 These eggshell-thin shards had been recovered from local farm fields  or created to appear so  and, respectfully displayed, had been conferred with an aura of preciousness. There is a long history of reverence for such fragments and I too have long been attracted to examples of what I have come to call 'inorganic roadkill'. Such fragments, whose patinated surfaces convey a sense of antiquity and timelessness, have interested me for years. 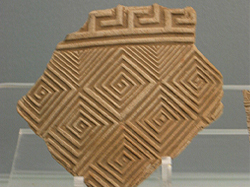 Whether they were found on recovered artifacts in museums or on abandoned machinery by the roadside, China was full of such rich surfaces. Explorations in the studio led toward the creation of a group of precious fragments derived from the contours of recovered eggshell fragments and featuring cobalt blue ceramic over glaze transfers brought back from China. 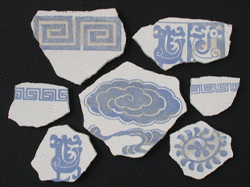 Other than the obvious allusion to eggshell-thin porcelain, a number of these elements were selected for incorporation into these and future objects. I am fascinated by the inventiveness of the Medieval artists and craftspeople (and even the cartographers) whether they were creating pieces for Cathedral treasuries or secular collections. Quoting loosely  and sometimes very loosely  from the natural world, they felt free to juxtapose unlikely combinations of forms and materials in order to create theatrical new Artefacta. The primary goal being that the results elicited a sense of wonder. 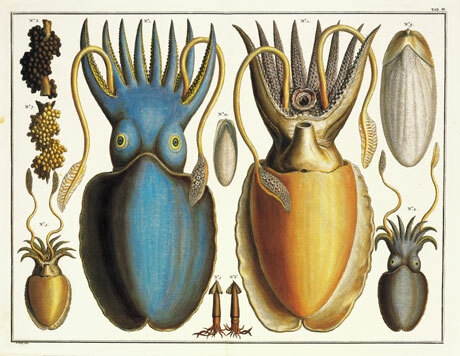 In their book Wonders and the Order of Nature: 11501750, Lorraine Daston and Katherine Park discuss, in Wonders of Art, Wonders of Nature, how "A wonder is something that so forcibly grabs your attention you are incapable of ignoring it, and because they don't fit into existing categories, wonders are perfect objects for making you rethink the world." Imagery and motifs evolved over the duration of this project. 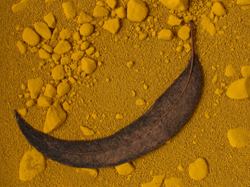 Primarily the result of the creation process, one will see, for example, quotation of the moth shape (Eurois Occulta or the Great Brocade moth), the scimitar-like eucalyptus leaf collected while on a residency at the Canberra School of Art, or the surface of a blue and white 'porcelain' fragment reappear as gobos for the light projections in the final gallery installation. 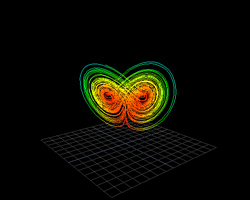 Any project associated with attraction and attractors will inevitably explore the nature of phototraxis (orienting towards light) or what has been termed the 'moth-effect'. In Is the Moth Effect Real?, Marc Green unpacks the contemporary research regarding fascination (Type B-2) and the manner in which individuals are drawn irresistibly toward certain objects. For me, these include cobalt blue coloured ultra-bright LEDs or, while driving at night, the reflection off of Scotchlite embellished jogging wear. I have explored this form of attraction through the use of scintillating gemstones, reflective surfaces, and glowing or UV reactive materials in past artworks and I am happy to be revisiting it here. "Night, noises in, 163 (v.2.0)" is a remake of an installation artwork created in 2003. Dissatisfied with certain aspects of the original, but excited about the general workings of the piece, I wanted to re-explore this artwork's use of the aforementioned 'moth effect'. 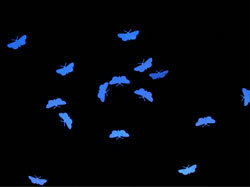 Illuminated by an ultra bright LED, the viewer's attention is attracted as much to the blinding glare emitting from the LED on leaving the gallery as it is to the reflections emanating from the Scotchlight coated moths on entering. As with the first snowfall of the year during which one becomes aware of the space between familiar objects and landmarks, the viewer finds and experiences the spatial boundaries within which the moths flash their reflected light. Installation artworks, by their nature, are responsive to their environment and consequently are slightly different each time they are mounted. "Cabinet, mysterious contents of, 304 (v.2.0)" is another re-visit of an earlier work. I enjoy the open-endedness of this series, wherein I am able to add or subtract the individual elements while re(configuring) the works. "Birds, which have no fear, 96" is configured as a series of three wedge-shaped shelves that provide the location for an accumulation of Artefacta. These range from created 'porcelain' forms, light emitting plates, bronze castings and chameleon painted or faux finished elements to recovered "inorganic road kill" (my term): rusted metal parts, tire-balancing weights, etc. This artwork, as do all of the artworks in this exhibition, derives its name from a link between a particular entry  a textual fragment  selected from the index of Oliver Wendell Holmes' novel, The Professor at the Breakfast-Table (1860), and the dead bird-like element featured on the shelf. "Architecture, an imperfect copy of some divine rule, 241" uses three wall-mounted, patinated and neon-backlit pressed-tin ceiling tiles. The final three works, shadow box framed digital prints presented in a row (clockwise: "Hollow beneath road, 179", "Ant, red, 245" and "Addison's dying sentiment, 292"), employ images taken while in Jingdezhen, China in the fall of 2005 and Lunenburg, Nova Scotia this past spring. The images were cropped, posterized and juxtaposed with details of photo-documented found objects, historical images taken from books or black and white image files downloaded from the internet. These images remind me somewhat of the high contrast imagery of the 1960s silk-screened souvenir decals that covered our Coleman camping cooler. In his review of the exhibition, Carl Hahn states: "That's what the Strange Attractors exhibit is all about: items that draw the human eye, surprise it and perhaps trick it, turning a fleeting glance into a longer viewing relationship." This is, I feel, a succinct and accurate preçis of both my intentions and the resulting outcome. Works that were not shown at the Harris-Warke Gallery but are considered to be a part of this body of work include a number of wearable objects. Works in the exhibition are for sale and range in price from $275 to $3,500 CAD. I also wish to acknowledge the assistance of the Alberta Foundation for the Arts. Strange Attractors, the title of my recent solo exhibition, is derived from the term coined to describe the predictably chaotic nature of turbulence. References are drawn to visual experiences of the uncanny and to the ability of both miniature artifacts and light to draw the gaze of the viewer. As much a means to clarify the creative process for myself, I intend that this web page will deliver, as well as an online presentation, an enhanced reading of the exhibited artworks.